By my fourth day, I was conscious of the similarities between the markets, no matter which city I visited. They all had a manger scene and a Christmas tree; all the stalls were built like little chalets; all piped Christmas carols into the atmosphere; all had vendors selling mostly the same comestibles and some of the same goods; and everyone was in a festive, peaceful mood. Christmas pyramids can be found in nearly every market. Stuttgart stood out from the others, though, with a number of unique aspects, starting with the sheer size of its market. Begun in 1692, this massive market was jam-packed the entire time I was there, like Times Square on New Year’s Eve, or a subway in Tokyo during rush hour. 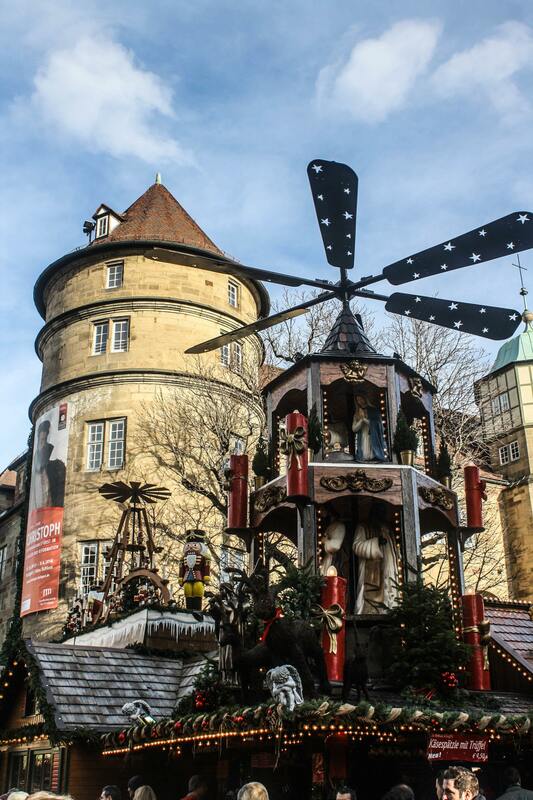 About 3.5 million people visit the nearly 300 booths every year, making it one of the largest Christmas markets in Europe. I emerged onto the enormous Schlossplatz and saw the crowds on the other side. At the fringes of the market, two plastic reindeer pulled Santa in his sleigh, holding a sack of toys. Expert and amateur ice skaters glided (or stumbled) on the glassy rink, and a sprawling model train set kept me entertained as I watched the cars speed around an entire village of buildings. I postponed the market for a bit, passing by the Neues Schloss, the Baroque new castle completed in 1746 and reconstructed after the war. Across the street, the Altes Schloss (Old Castle), completed in 1578 and also reconstructed after war, featured a lovely courtyard with two levels of arcaded terraces decorated for the season. Within, the Württemberg State Museum boasts a terrific collection of brilliant medieval altarpieces. I skirted around the old castle and stumbled upon a sprawling antique market in Karlsplatz — a real antique market, not a bunch of attic raiders peddling broken Coke bottles or rotting wood tennis rackets in dire need of restringing. It offered a nice complement to the heavily Christmas-themed items found in the markets. 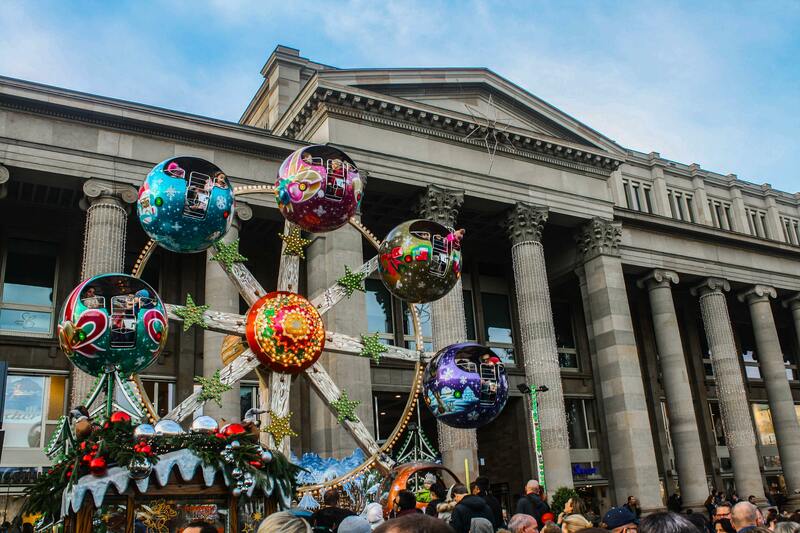 Take a ride in a Christmas ball in one of Europe’s largest Christmas markets. I joined the crowd in Marktplatz, where traditional wooden huts boasted some very elaborate decorations: forests of decorated conifers sheltering clusters of penguins or polar bears; a village of carrot-nosed snow people; parliaments of owls among pine cones. A Christmas tree with red and gold stars and gift boxes soared above the whole scene. I picked up a chocolate-covered banana to snack on as I wended my way through the market. Although this market offered many of the same items I was now becoming familiar with, it also sold items I didn’t see anywhere else: lambskin slippers, kitchen utensils, and small vacuum cleaners. Lugging a few bags now filled with very fragile ornaments, I carefully made my way to the adjacent market, alongside the beautiful Stuttgart Collegiate Church on Kirchstraße, which spills into yet another market in Schillerplatz that seemed to have breached maximum capacity. I carved out a little breathing space for myself while I enjoyed my evening collation of spätzle with meatballs, green beans, and red bell peppers in an herb sauce. Across from me, evocative foot-long winter scenes under arches of lanterns, fir trees, and steeple tops — all meticulously carved from wood — tempted me until I saw their price tags, so I moved on, heading in the direction of the train station, ready to return to Frankfurt. But Stuttgart would not leave me without one more unique aspect: a ferris wheel with eight carriages in the shapes of multicolored Christmas balls. I wondered what one-of-a-kind characteristics the markets in Düsseldorf, my destination tomorrow, would extend.